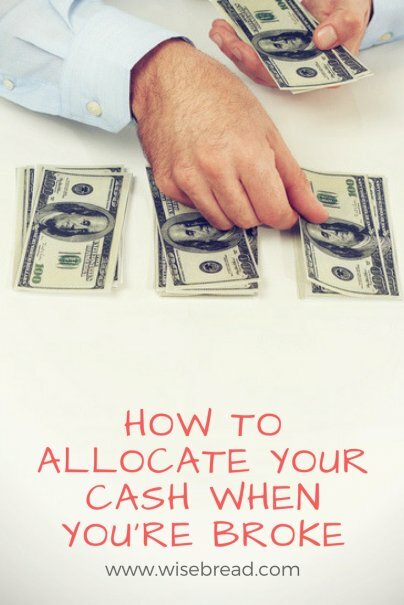 There are many reasons why you might have a serious lack of cash, and it can seem impossible to budget the little bit of money you have on hand. Of course, the obvious question is "How did I get in this mess in the first place?" and the answer is usually due to a lack of smart budgeting. But since we can’t go back and change the past, all we can do is look towards the future and try to do better with our money management. It won’t take long until your creditors come calling. The worst thing you can do is ignore those calls, and the best thing you can do is take control of the situation, no matter how out of control you feel. Ask your creditors upfront for a payment extension or an alternative payment plan on a temporarily basis until you can recover from your financial hardship. If you find you are falling a few hundred dollars short of your monthly financial obligations, sit down and prioritize the bills you need to pay such as your mortgage, electricity, and insurance payments. The other bills can wait until you free up more cash. You want to make sure you keep your home and have the basic utilities you need to survive. Again, speaking to your individual creditors can also help you extend payments without serious consequences and assure your creditors you are doing your best to get back on track. If you have been contributing to a savings account, it would be wise to put that money to better use. Otherwise you will find that in order to save your typical $50 a week, you will need to pay a few hundred dollars in overdraft bank fees, credit card interest rates, and other fees for making late payments or missing them entirely. A big mistake people make when they are short on cash is to use their credit cards like they would their paycheck. They are quick to spend on credit because it is available, but they fail to see the long term impact these purchases will have on their financial life. The golden rule of credit card use is that you should only spend on credit what you have in cash reserves. Since you have no cash, you're likely to end up racking up even more debts you can’t afford. If you do not foresee an end to your budget crisis in the immediate future, you should start to take action now to find ways to boost your income. Depending on the reason for your financial hardship, you may need to find a second job and bring in another paycheck. You may also want to consider working overtime when you can or offloading some of the stuff around your home through a yard sale or online auction. The faster you can regain your financial ground, the less expensive this period will be for you in the long run. While the last thing you may want to do is deal with your money issues, now is the time to construct a better, more viable budget to prevent this from happening again. Even if this current financial hardship was due to unforeseen circumstances (such as a medical emergency or job loss) you should make a plan to be better prepared for such instances in the future. Boost your income and your savings goals, and learn new tricks to start living below your means. It will take some sacrifices to survive a period of being broke, but the only way to assure you will get ahead of the game is if you commit to better money management and work as hard as you can to get back into the black. If you fall into despair and just avoid the situation altogether, you must know that things will only get worse. The longer you take to act, the longer it will take you to recover financially. What if there is 0 cash, no job, and can't seem to get any sort of job? There are still about 15 people, unemployed, temp, or part-time workers looking for every full-time job available. You need to get creative - create a job, make something, scrape metal, do a yard sale, volunteer, do some "gorilla" job seeking, network, move, provide a service, pray, go to your place of worship for help and ideas, ask a friend to be your accountibilty partner, go to the library to check out books to get ideas, look on Craig's list, Monster.com, attend a class on job seeking run by the county or a place of worship, read "What Color is Your Parachute," take a course, check out bulletin boards at the library, grocery, community center, places of worship. Don't be dead in the water, keep paddling. Hasn't anyone heard of The 7 Cures to a lien wallet? Hey Tisha, Great article. Whether we like to admit it or not, many of us have been in a tight money situation before. I agree that prioritizing is one of the most important parts of surviving. Once you set your priorities everything else seems to drop into place.